LAMB KEBABS AND MINT RAITA, scroll down for English translation… C’est pas encore l’été mais la saison des mijotés et des braisés tirant à sa fin, j’ai pensé vous partager une recette archi-simple que je fais depuis plus de 10 ans, et qui fait toujours l’unanimité: les kebabs d’agneau et leur raïta à la menthe. Ces délicieuses brochettes de viande hachée, bien parfumées, sont tout d’abord badigeonnées de yogourt nature avant de passer sous le grill ( ou au barbecue). Les kebabs sont présents de la Turquie au Maghreb, en passant par l’Inde, et ma version a une touche indienne avec sa raïta à la menthe. La raïta est une sauce rafraîchissante au yogourt et au concombre. 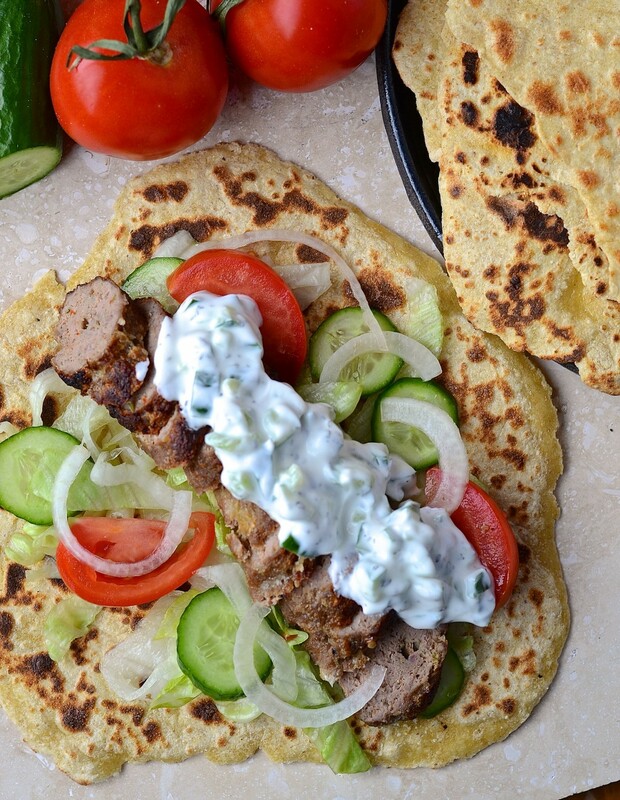 Elle est à l’Inde ce que le Tzaziki est à la Grèce… Le contraste entre la fraîcheur de la raïta et les épices des kebabs offre un réel plaisir en bouche… Une recette à essayer pour bien partir la saison des grillades! Mettre tous les ingrédients dans un robot culinaire, sauf la viande d’agneau, l’huile et le yogourt. Activer le robot pour hacher finement les ingrédients sans transformer le tout en purée. Dans un grand bol, mélanger avec la viande à la main. Laisser reposer une heure au frigo. Pendant ce temps, préparer la raïta en mélangeant tous ses ingrédients, tout simplement. Préchauffer le grill du four (broil). Diviser la préparation à la viande en 10 portions égales (ou plus, ou moins, en fonction de la grosseur désirée) et leur donner la forme de saucisses. Enfiler sur des brochettes. Badigeonner légèrement les kebabs de yogourt puis d’huile. Faire cuire sous le gril environ 4 minutes de chaque côté ou jusqu’à ce que les kebabs soient dorés. Ne pas trop faire cuire pour ne pas assécher la viande. 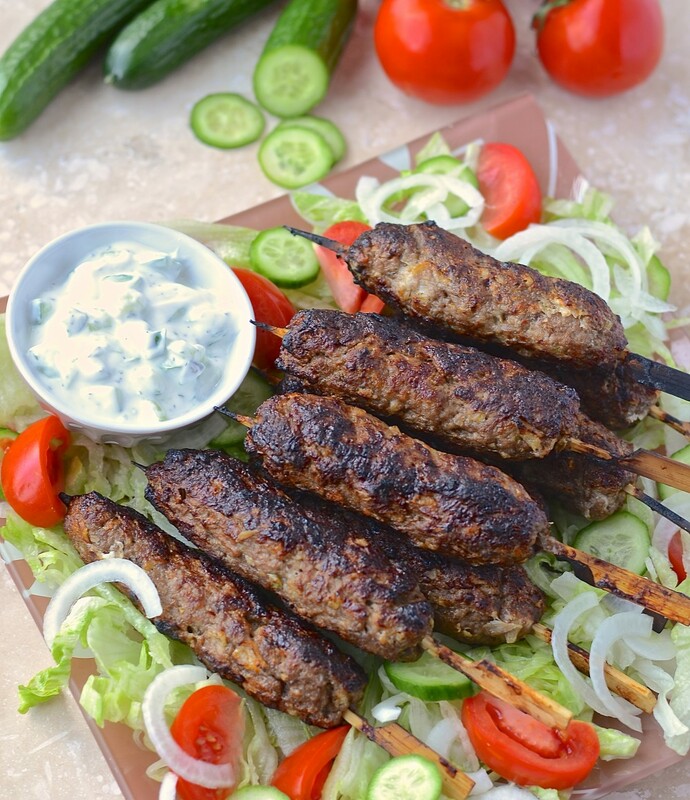 This is a simple kebab recipe I have been doing for at least 10 years! 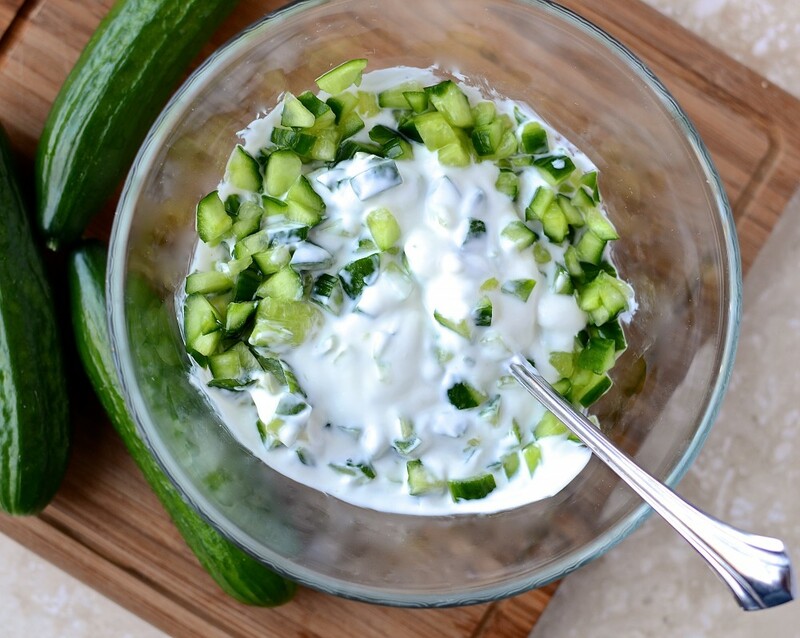 I love the contrast between the fresh yogourt, cucumber and mint sauce (raita) and the spicy ground lamb kebabs. Kebabs are popular from Turkey to North Africa, and of course in India. My recipe is adapted (and translated) from an Indian cookbook (Cuisine indienne, by Manisha Kanani) but this time I added a Turkish twist to it, by using my kebab spices from The Spice Trekkers (imported from Turkey) instead of some garam masala. Have fun changing the spices! Mexican or Cajun kebabs? Why not! Put all the kebab ingredients (apart from the meat, yogurt and oil) in the bowl of your food processor. Mix until finely chopped and pour over the ground lamb in a large mixing bowl. Blend with your hands until well combined. Refrigerate for 1 hour. Meanwhile, prepare the raita, by blending all the ingredients in a small mixing bowl. Cover and refrigerate. Preheat the oven – set it to « broil ». Divide the ground meat mixture into equal parts (8 to 12) and roll these into a sausage shape. Insert a bamboo stick into each kebab. 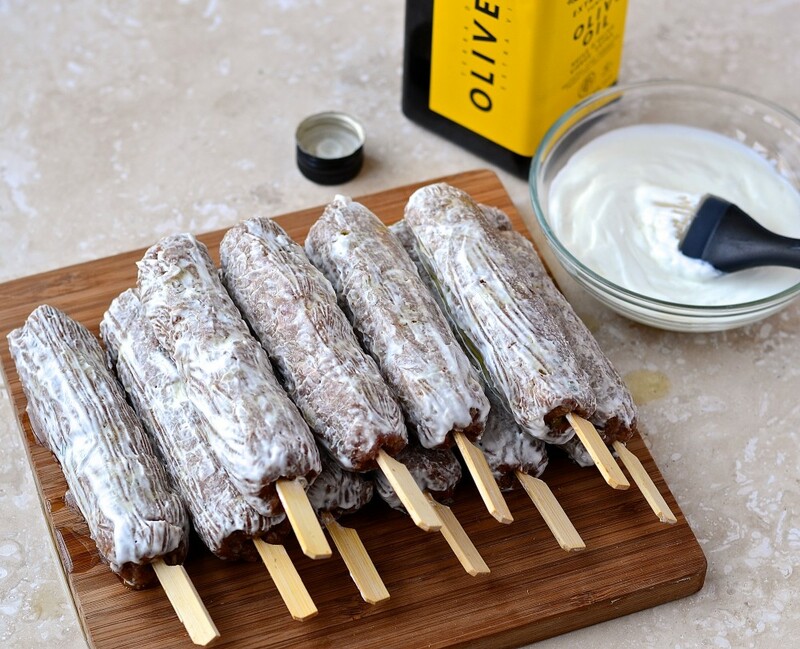 Brush some yogurt, then some oil on the kebabs. Cook in the oven (broil) for about 4 minutes on each side, or until golden brown without being dry and overcooked. You can serve the kebabs over the salad of your choice, or prepare some homemade chapatis and make the best Indian wraps ever! I hope Angie and my Fiesta Friday friends will like my kebabs, because this is my contribution to this week’s party! We made these for lunch the other day and served them in pitas with the raita. So good! Thanks for another great recipe. I’m off to buy yogurt as I have all the other ingredients to make your delicious sounding kebabs. I hope you will enjoy the recipe, thank you! Oh Catherine, this looks fabulous. The food, the photography, everything! Thank you Patty 🙂 You are so kind ! These look and sound amazing, especially to this lover of lamb! Lamb kebabs with home made bread looks delicious! What a great plate to bring to Fiesta Friday! Catherine, these look so scrumptious! I wish I could eat some this very minute! Great photos, too! This looks delicious, Catherine! I love kebabs and raita is one of my absolute favourite accompaniments. The slightly tangy, cool flavour paired with the heavy, deliciously spiced meat is heavenly! Have you ever tried it with any other kind of meat? No, but I am pretty sure they would be wonderful with beef, pork or veal… I am not sure about ground chicken or turkey, which would probably be too lean and dry… I really enjoy the taste of lamb, and like you said, the contrast wit the tangy yogurt sauce is so good! I’ve never cooked lamb before because I’ve been intimidated by the bones. Because this ground lamb, I just might give it a try…I have a craving for it already! Catherine- they look so so so good. I wish I could pick one (or may be a two, three?) and have them right away.. i love how you’ve coated them with yoghurt before cooking them. Going to try this method with our chicken kebabs. thank you 🙂 They are so simple to make! These kebabs look delicious, Catherine! Love the alternative spice ideas. Beautiful photos too! Thank you! The alternative spice ideas are something I would like to explore… Can you imagine mini-kebabs made with ground turkey, dipped in cranberry sauce? Yummy winter- Christmas appetizers…! Merci! C’est très facile et simple en plus… J’ai souvent servi ces kebabs l’été, sur le BBQ, parfait pour recevoir simplement! Je confirme tout est parfait ! Ces brochettes pleines de saveurs et parfums doivent être délicieuses !! Catherine tout est parfait, tu est géniale!